...and some of The Vet Clinic's residents, past and present. 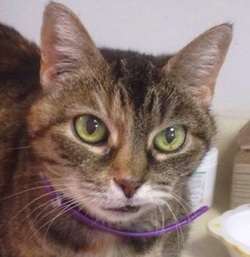 Coco was one of The Vet Clinic house cats, surrendered to us by owners who could no longer care for her. She was an amazing cat who brought laughs to everyone around her, always begging for food and doing anything she could to sneak some when no one was looking. Sadly, we lost Coco to bone cancer in 2014. We will miss you Coco! 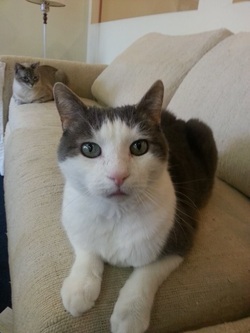 America (foreground) and Ida (background) were part of our Vet Clinic family for three years. They enjoyed relaxing in the breakroom while the staff had lunch. Happily, they have been adopted out to loving families. 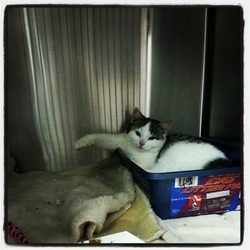 Misha also was a member of the Vet Clinic family for three years. He is a total lovebug and will steal your lunch when you're not looking. He found his furever family in 2017. 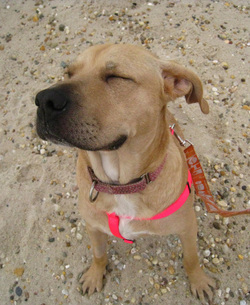 Lulu lived at The Vet Clinic for almost 6 months before being adopted by a wonderful family. Sadly, Lulu lost her battle to cancer in early 2014. She was a happy, goofy, lovable girl who brought joy to her family and the staff at The Vet Clinic. 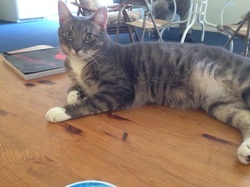 Sudden was one of our kittens for adoption who got his "furever home" with longtime clients of The Vet Clinic. These amazing boys were adopted by clients of The Vet Clinic and are now living the good life! 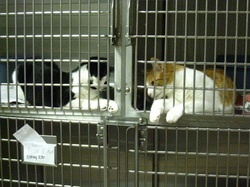 Two feline patients in our kennel get to know each other. 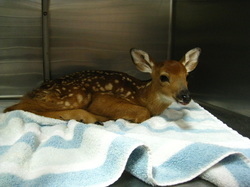 A very young fawn that was brought to The Vet Clinic with wounds from an animal attack. Luckily, the wounds were not serious and the fawn was sent to recover at the Evelyn Alexander Wildlife Rescue Center.